Democrats running for the Washington House of Representatives in the 9th Legislative District have brought in thousands in contributions since November, but Republicans still control most of the money in the race. 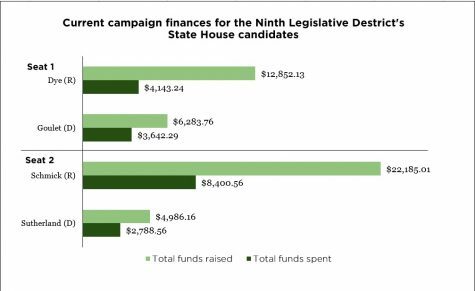 The incumbent Republicans already had campaign money on-hand and have had more time to seek donations since they registered to run earlier in the year. Jennifer Goulet, the Pasco Democrat running for position one, has received $6,283.76 in campaign donations since announcing her campaign in November, according to the Public Disclosure Commission. Goulet is challenging incumbent Rep. Mary Dye, R-Pomeroy, after losing 66 percent of the vote to Dye in the 2016 election. Dye has received about $5,300 in donations since the start of her campaign. While she has brought in less money than Goulet thus far, Dye’s campaign had a starting balance of $7,547.13 from previous fundraising efforts. Adam Tradii, Goulet’s campaign manager, said when Goulet ran for the first time in 2016, she had little backing from the Democratic Party and little political background, but he expects that to change. “With the expected Democratic upsweep, our internal numbers are showing us already winning,” Tradii said. According to the PDC, about $5,160 of Goulet’s campaign donations have come from individuals. L’Ecole No 41, a winery from Lowden, contributed $120 worth of wine to Goulet’s campaign for a fundraiser, Tradii said. The Washington State Democrats also donated about $600 toward a program called VoteBuilder, which holds confidential voting records for the purpose of reaching out to voters. Goulet supporters usually donate between $5 and $500, Tradii said, and they outraised Dye by about $1,000 last month. Goulet wants to run a campaign that reaches out to grassroots supporters rather than big businesses. “We think that it’s important that a representative of the people actually represent the people,” he said. Goulet would receive donations from small businesses and farmers, he said, but their campaign is almost 100 percent funded by individuals at this point. Dye’s campaign currently has no donations from individuals, according to the Public Disclosure Committee. Dye received $2,400 from several political action committees, including the Pacific Merchant Shipping Association, Washington State Auto Dealers and the CenturyLink Inc. Employees PAC, according to the PDC. Dye’s other $2,900 came from businesses, including Puget Sound Energy, Vision Source, PEMCO Mutual Insurance Company and Randy & Michele Kiesz Farms. Rep. Joe Schmick, R-Colfax, has the most money of all the candidates running in the 9th. Schmick, who holds Position 2 in the state House, has brought in $18,700 since registering in February of last year. Over $12,000 of his donations have come from businesses, according to the PDC. He has received $350 in campaign contributions from individuals. Matthew Sutherland, the Pullman Democrat challenging Schmick, has the least cash on-hand, but has also had the least time to get donations. Registering nine months later than Schmick, Sutherland has brought in almost $5,000 in donations. Over $4,200 of that has come from individuals.